Educators, Keep Your Own BLACK RAT SNAKE! 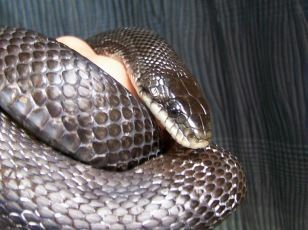 At six feet in length or more, the Black Rat Snake is Michigan's largest snake. It is also one of the rarest. Nature Discovery has a special program whereby any educational venue that schedules us for a presentation or exhibit can acquire a young rat snake! Read More information on getting your Black Rat Snake. 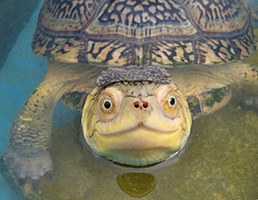 With over 40 species of Michigan snakes, turtles, lizards, frogs and salamanders, Nature Discovery is home to the largest collection of live Michigan Reptiles and Amphibians in the state. These animals are used for our presentations, exhibits, birthday parties and can even be visited at our facility. We may be able to provide your institution or classroom with a live yearling rat snake or fox snake. Ask us how! Check out our species list and learn more about our animals here. 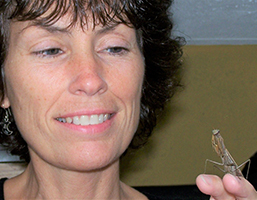 When it comes to high-quality, educational and entertaining Michigan Wildlife Presentations, the possibilities are endless for any school, organization or other group – from pre-K to seniors, and general audiences, too. We use any combination of our live Michigan reptiles and amphibians, other live props, Powerpoint images and audio recordings to enhance many of them. Check out our huge array of presentations on Michigan Birds topics, too. For a detailed list of the presentations available, please view our Presentations page. Our exhibit is a huge hit where ever we go, whether it is our full exhibit, featuring over 40 species in 13 to 15 aquariums and a “turtle pool,” or a mini-exhibit, featuring strictly Michigan Frogs, Amphibians, Turtles or Snakes. Interpretive signs and posters plus friendly and knowledgeable staff make the exhibit experience highly interactive for all visitors. Hold a Blue Racer, watch a Box Turtle eat worms, feed crickets to frogs, and discuss any of them with our staff. 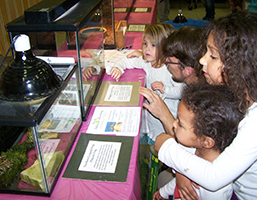 For details, check out our Reptiles & Amphibians Exhibit page.